In our book Energy Efficiency is the name of the game when constructing new homes. Our cutting edge energy initiatives not only set the standard in the Oklahoma City Metro but also across the country. We push our competitors to raise themselves up to our level of efficiency. It is our mission to constantly excel in energy excellence as we explore and implement new technologies. Our goal is to create better, tighter, more efficient homes and in the process we reduce our waste output which helps lessen our impact on the environment. We are so invested in keeping energy costs down that we’ve gone beyond Energy Star rated homes to create our EnergyAdvantage homes. For us, it’s not just about the efficiency of appliances, windows, heating and air conditioning and the other usual suspects. We look at your whole home as a system. By treating your home as a system and working on reducing the energy costs across the board, our homes are rated on the HERS (Home Energy Rating System) scale from 35-65. Just to give you some perspective, the lower the HERS score the more energy efficient the home and the more money you save. A typical used home scores a 130 on the HERS scale whereas a new home that is not HERS certified is generally around 100. Ideal Homes understands the ramifications of the rising cost of energy. Not just on your budget, but on the long-term impact environment as well. Go green, or go home. Or with our homes, go home to a green home! 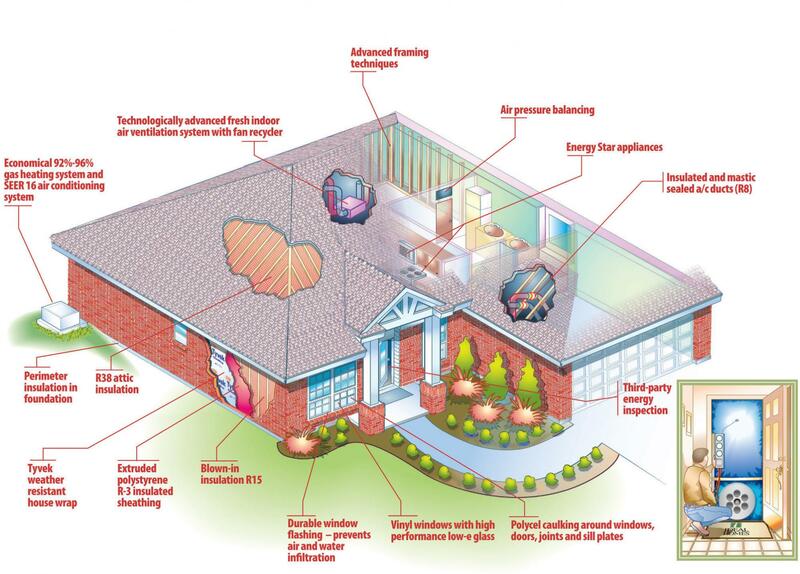 We treat the entire home as a system creating a beautiful, efficient, healthy, and better built home. Then, just to be sure, we hire an independent third party to test every home. Your new home will have one of the lowest HERS (Home Energy Rating System) scores in Oklahoma. The HERS score the a true apples-to-apples comparison that helps you understand the real cost of a home. The lower the HERS score, the more you save every month on heating and cooling. Ideal Homes is the only builder in Oklahoma to Guarantee Low Heating and Cooling costs. Through a partnership with Environments for Living, if actual usage goes over the guarantee, we’ll pay you the difference.